The biggest and presumably best polls for today’s by-elections are better for Labor than some, but still suggest Braddon and Longman could go either way. As Super Saturday dawns, The Australian brings us perhaps the two most heavy-duty seat polls yet published in Australia, with Newspoll surveying 1015 respondents in Longman and 1002 in Braddon between Tuesday and Thursday. In both cases Labor records a lead of 51-49, putting them at the high end for Labor’s polling record throughout the campaign. Labor is credited with a solid improvement on the primary vote compared with the 2016 election result, from 35.4% to 40%, while the Liberal National Party is down from 39.0% to 36%. This gives Labor the buffer it needs to deal with One Nation, up from 9.4% to 14%, and their stronger flow of what I presume are respondent-allocated preferences to the LNP. The Greens are on 5%, compared with 4.4% in 2016. In Braddon, the primary votes are Labor 40% (unchanged on 2016), Liberal 43% (up from 41.5%), the Greens 5% (down from 6.7%) and independent Craig Garland 8%. As did the YouGov Galaxy polls for the News Corp tabloids last week, the poll asked respondents how they would vote if Anthony Albanese rather than Bill Shorten were leading the Labor Party, which in both cases would supposedly have lifted Labor to leads of 55-45. Candidate approval questions found 37% satisfied with Labor’s Susan Lamb in Longman and 47% dissatisfied, while Justine Keay in Braddon was on 42% and 41%. Trevor Ruthenberg’s military medal issues apparently haven’t registered, with 61% saying they would not influence their vote, 22% saying it made them less likely to vote LNP, and 16% of people who were presumably going to vote LNP anyway implausibly indicating they would be more likely to vote LNP. Obviously been some money laid on Labor in Longman and Braddon. Labor favourite now on both Centrebet and Sportsbet-1.33 and 1.40 in Braddon and 1.70, 1.80 in Longman. Punters relying on Newspoll I guess. Sharkie 1.01 and 1.04. I see the Steam Powered Appliance is back on his normal form. Sad. Who will be on the ABC panel? ABC News 6pm-10pm, Presented by Greg Jennett, Laura Tingle and Andrew Probyn, with analysis by Antony Green. Glad I put money on Lamb when she was at $2.60 on Sportsbet yesterday. Quietly confident Labor will get over the line in both. What will be really interesting is the post election spin. Libs badly into delusional stuff at the moment from what i can see on the teev, but the media will soak it up and run on high repeat. Good result is of course ALP getting both Longman and Braddon, but i am doubtful they will get both. 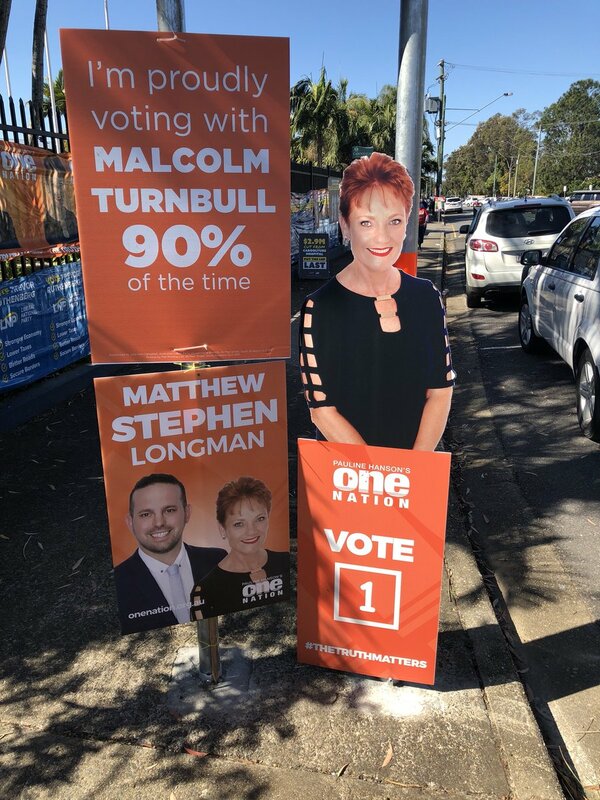 Longman the better chance i think with Malcolm and the candidate showing up so badly on the ground. A real crunch in Mayo could reflect very badly on Malcolm, but Downer being humiliated there has been taken as a given for so long may not actually get much coverage? And the cowardice of not running in Perth is inexcusable. Disappointing that the press is letting Malcolm get away with dissing Shorten for where and when he goes, but not even questioning that he has not put anything into the Western Australian or SA seats. Who are the other two Liberal candidates who live outside their electorates? Downer I expected but I am surprised about two more? And trivia/legality question – if you are a candidate, but not a resident, are you entitled to vote in the bielection? I was amused to see in the Advertiser while out shopping that Turnbull has said Downer would still be the Liberal candidate in 2019. First, what confidence! He didn’t say as sitting member. Second, real subtext: “no you cannot have one of those safe inner Melbourne seats you have been working in for the past ten years. Those are for the boys. Try to win back the family seat, or you get nothing.” If Sharkey wins, this could be career ending for Downer. No – you still need to be eligible to vote. The Pauline cardboard cut out needed just a bit of embellishment.. So you could be elected then move into the electorate if you win? So why vote for her, you may as well vote Liberal. I think Wayne needs a cup of tea and a good lie down. I think Nine gobbling up Fairfax only underscores how important the ABC now is. Lots of people must realise this now. The ABC political reporting is basically as bad or worse then commercial tv. Exceptions such as Antony Green are there, but it is cowered and greatly diminished. Once I’d never miss ABC News, now I’m basically at the stage of don’t waste my time. As such I’m not much inclined to go to bat for them – they have barely defended themselves. Above all I no longer trust them. It would be far more humane to just close it. Its swirling the drainpipe seeking out how to go lower. ABC Business News managed to give favourable coverage of BHP selling their US Shale Oil business, without a mention they had lost well over $20 Billion big ones! Just voted in Perth…………polling booth similar in appearance and vibe to the morgue. Naturally hoping for a Labor-Sharkie sweep tonight. To be honest though I am the least confident about Longman. My fear is that PHON preferences will flow more tightly to the Liberals than they have in that Newspoll, given their cards are directing preferences, and that this may well get the Liberals across the line. I am more confident about Braddon. ABC 24 discussing byelection. General voter dissatisfaction with both parties.. many say will cast donkey vote. This is delivered with straight face by donkey reporter. Talcomns strategy of timing the byelection for non sitting period & dragging out the process to maximise his PPM status comes unstuck tonight. No amount of spin will save him from chief whistle blower Dutton. So that a conceded loss of Mayo? God Emperor Turnbull will rule the world for 1000 years. Wayne, you’ve definitely conceded Mayo…………..did Georgina Downer phone you with the bad news? Landslide is a bit of a worrying term TBH. Usually used in the context of natural disasters. Oh Mayo is back in the mix… yeah, he’s nervous. He copied and pasted the wrong line. Geez, how about ignoring Wayne/Shows On. Agreed, the troll posts and his captive sheep follow. The troll must be laughing it’s head off at them. Showsy was and probably still is a Labor supporter. It’s probaly his only redeeming feature. Super Saturday here we come…. I am like I am getting ready for a big match. Just had to have a nervous pee. C’mon Team Labor, make my day. I’m picturing Wayne as some Young Liberal with too much time on his hands.